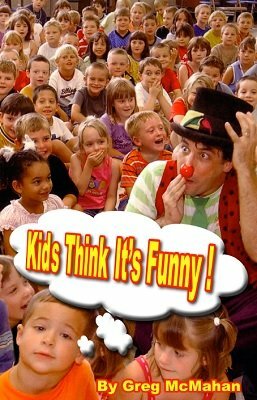 Routines and ideas to add plenty of laughs and fun to any children's show. One Hundred Balloons an Hour, a technique developed over thirty years of making balloon animals. Using this technique, you can do about 100 balloons an hour and still keep everybody entertained... without them waiting in a line! Balloonology Seminar, a balloon twisting class that also works very well as part of a birthday party show or other children's event. In the Days of Yore revives the old Monkey Bar trick, known far and wide as a sucker gag, into the centerpiece of a storytelling routine... without the audience feeling like a victim. A young prince, wanting to be a great wizard, performs a magic show for the king and his friends. But he never practiced, so the trick isn't working at all well. Seeing the dilemma, the court wizard secretly helps the prince and saves the day! This script would fit perfectly into a renaissance festival show or a Harry Potter theme. It could be adapted for just about any type of show, kids, families, adults, comedy, storytelling... even a corporate environment. Add audience volunteers and simple costumes..., this could be your signature routine! 15 Minutes with a Thumb Tip and Wands is the opening routine Greg McMahan has been using since 1998. It always gets a great response and tons of laughs. With just a thumbtip, a silk, and some easily found comedy wands, the audience is kept laughing almost non-stop! "It's time for the world famous magic trick of the universe!" With these words begins the funniest 15 minutes that keeps kids laughing from the start. Perfect by itself, or as an opener for longer shows. Everything goes wrong for the magician in this comedy routine perfected over hundreds and hundreds of performances. This routine is flexible... it's easy to add new gags or props, and it works well when shortened. For instance, instead of using a multiplying wand at the start, Silly Billy's Silly Wand would work great. First the magic wand causes problems, becoming two, then three, finally five all over the place. The wand won't do, but the next wand is huge and won't stay put. Getting on with the trick, the frustrated magician discovers that getting the hanky into his hand is a lot more complicated than he thought. Once that's taken care of, the wand breaks. With the children's help, the hanky trick finally works...sort of. Instead of changing color, it's gone! Great trick, but now there's a sneeze coming, and that hanky would sure come in handy. Once again, the kids come to the rescue by bringing it back by magic...and making sure they don't get slimed! Rocky Raccoon - Spring Animal. This puppet is available at just about any magic shop. Once you've seen one in action, you'll know why it's Greg's signature routine. This ebook includes 15 pages of routines, ideas and gags with Rocky that are sure to win over any audience. Over 25 chapters of solid material just waiting to inspire you. After reading this ebook, you'll be sure to come up with many new ideas of your own. 1st edition 2005, 105 pages.